Will international pallet usage increase in the face of lower freight rates? 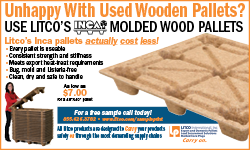 Nail-free and with curved corners, Litco’s Exporter pallets are approved for export as-is per ISPM 15. Modern Materials Handling (MMH) Magazine recently hosted its Annual Pallet Report Webcast, (available on demand here) once again featuring Dr. Marshall (Mark) White, President of White and Company, and moderated by Josh Bond of MMH. 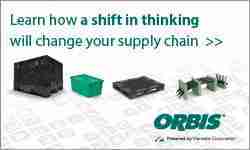 The webcast was sponsored by ORBIS Corporation. Here are some takeaways from that event. Does a lower prioritization on pallet price reflect that customers are more interested in pallet quality? Price as a most important factor in pallet selection has dropped from 60% of respondents in 2016 to 59% in 2017, and down to 57% in 2018. While most of us would like to see more pallet buyers take a broad approach to understand their total pallet cost impacts versus pallet price, as Bond intimates above, Dr. White suggests an alternative possibility. Shuert Ex Air export pallet. 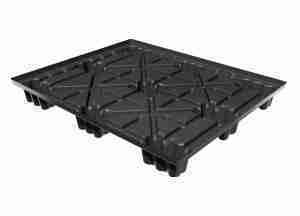 Are lightweight units leading the way in plastic pallet market growth? Is the block pallet trend ebbing? In 2006, 6% of pallet production was block style, Dr. White noted. In 2016, 21% of production was a block style pallet. With retailers such as Costco demanding block pallets, and their availability through poolers such as CHEP and PECO, more and more pallet users have become familiar with block pallets. “People began to recognize that the block pallet is very functional. 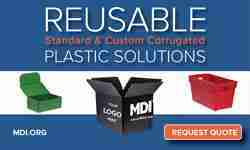 In many ways, it is much more functional and can reduce operating costs. He noted that the slide is consistent with manufacturing trends–75% stringer and 21 to 25% block. “I think we are starting to see that growth in block manufacturing starting to ebb a bit, and it makes sense. Certainly, the rental companies are all on block pallets, and the pools are maturing. But the growth in the recent past from stringer to block pallet was significant. This year’s survey showed an increase in wood pallet purchasers buying new, with a significant drop in those purchasing used pallets, which speaks to the continuing degradation of pallet core quality. “The availability of the core that becomes the basis for used repaired or remanufactured pallets in the marketplace has declined,” Dr. White said. “And as that declines, the quality of used pallets has also declined.” He cautioned, however, that the used pallet market very much pertains to the 48×40 pallet, which is only 35% of the pallet market. “This doesn’t really tell us what is going on with repairing the odd sizes…” He suggested that increased purchases of new pallets might help improve quality in the used pallet market. The survey indicated that at least 37% of pallet users would be interested in an alternative pallet pooling service to major providers such as CHEP, PECO,iGPS, and 9Bloc. According to Dr. White, the trend makes sense. Pallet rental can be a poor fit for many smaller manufacturers. He emphasized that a lot of third party companies are making pallet management services available for manufacturers of a smaller scale or in non-48×40 pallet applications. “I’m happy to see this. It is good for our environment, and it continues to control the cost of consumer goods,” he continued. According to Dr. White, the leading trend to watch in terms of pallet implications is international trade. He notes that the U.S. usually exports roughly 12 million TEUs (twenty-foot equivalent units) annually. Roughly half of that volume is still floor loaded, while the rest is palletized. If the floor loaded portion was converted to palletized, it would require an extra 60 million pallets annually. Dr. White noted that freight container rental has decreased by 45% between 2014 and 2017. While the use of pallets can reduce freight capacity by as much as 10%, there are significant labor-saving benefits to palletization. He noted that loading a 40-foot container can take six to eight labor hours, while palletized freight can be loaded in less than one labor hour. Dr. White noted the rapid increase in e-commerce volumes. He said it will be difficult to tell what the impact will be, at this point in time. For now, the major difference is in the last mile of distribution, which is the last leg to the retail store, or in the case of e-commerce, the last from the fulfillment center to the online customer’s home. He noted that currently, the front end of the e-commerce supply chain is still highly palletized. It is possible, however, if improvements are made in parcel-direct shipments direct from the manufacturer, it could impact pallet usage related to shipping goods from the manufacturer to the fulfillment center, as well as for order picking. To view the webcast, follow this link.